Dan Moody is probably best known in the food world for being sous chef to Ludovic Lefebvre through LudoBites 6.0. Since then, he’s been doing his own thing, showing up here and there with his own iteration of a pop-up. I missed Moody’s Relate stints in San Diego and Arizona, but I did catch him at a dessert night at Scoops Westside last July. 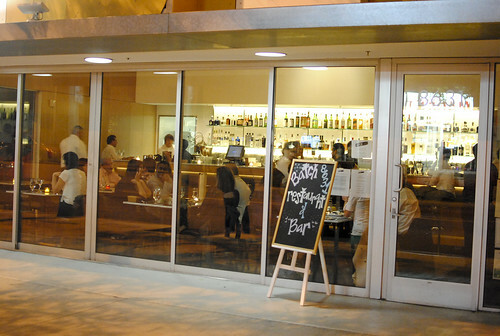 His latest venture was this pop-up at Batch in Culver City for just a 5-day period. I gathered up some of my coworkers and dropped in right in the middle of the run. 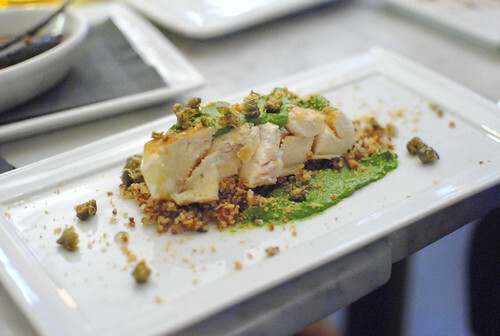 The menu was fairly concise and very well-priced; 13 dishes were available, all within $15. We ordered one of everything and doubled up on some of the ones that sounded most interesting. 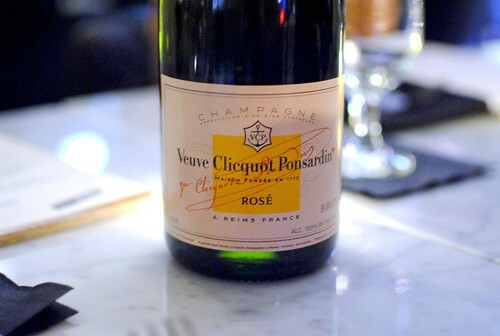 Although Batch’s regular beer/wine/cocktail list was available, one of my coworkers brought in this bottle for us to enjoy. Thanks Yury! 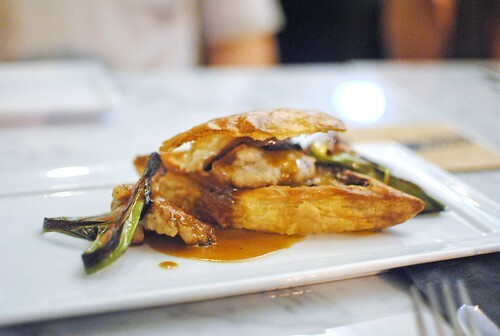 The light and flaky puff pastry was a highlight, as was the crispy, tender sweetbreads. 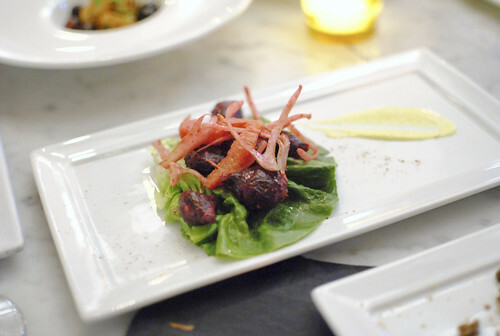 Blood sausage and veal jus really added some heartier savory flavors as well. I enjoyed this one quite a bit. This was one of the highlights of the meal. The beef was tender with just a slight chew, showing off good texture. The mustard ice cream made the dish, adding a cool heat to the plate that really rounded out each bite. Now this was pretty interesting. The perfectly cooked egg was rich and runny, while some chanterelles and a mushroom ash added an earthy depth of flavor. 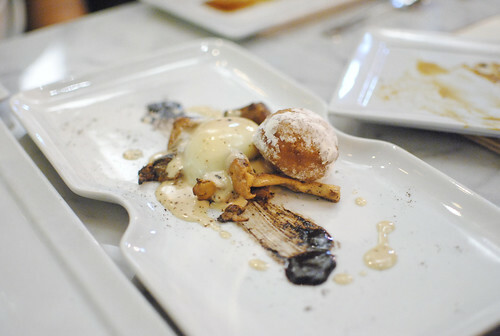 I do like the mushroom-egg combination; the foie hollandaise and coffee beignet brought some added complementary flavors. If only my breakfasts could be so decadent! 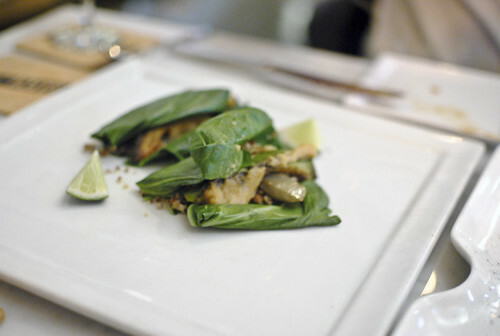 Cool, refreshing and ultimately a very simple salad featuring the root vegetable. This one didn’t work as well for me, though vegan tacos typically aren’t my thing. Strong earthy flavors came through, but I was looking for something a bit more dynamic. There was something spicy in here…almost too spicy for me. 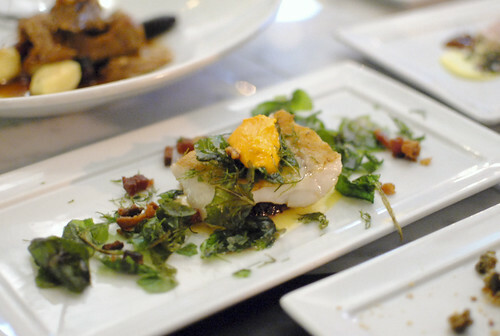 Luckily, it was tempered by some cool grapes, and I was able to hone in on the fish and citrus flavors in the dish. I’m not sure I got the beer part of the concept though. The rock cod was cooked well leaving a rather moist and flaky fish. A little bit of a curry in the sauce added some extra flavor, also accented by the vadouvan. Fried spinach was a nice touch. Although the chicken was cooked sous vide, I found it a touch on the dry side. Spinach gremolata added much of the flavor and color, while quinoa added some extra earthy notes. 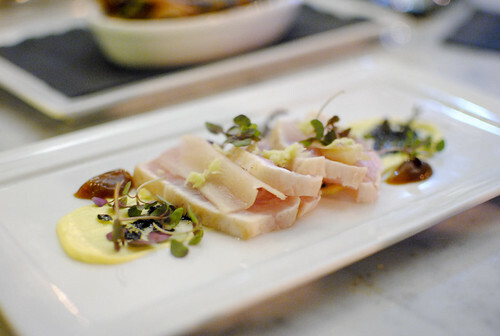 I enjoyed the nice pieces of albacore with the Japanese accents; sushi rice in a creme anglaise was a fun interpretation. Something had a very floral essence (I couldn’t pinpoint it) that was a bit odd to me. 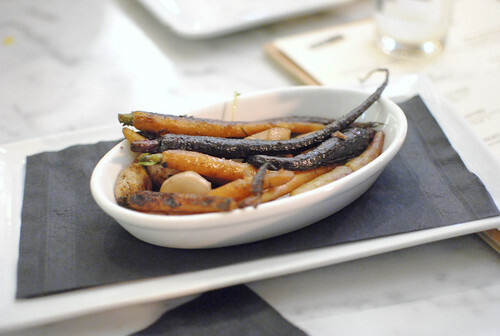 This was a simple plate of roasted vegetables with a natural sweetness brought out by oven. I particularly liked the charred parts. Nothing special, but it wasn’t trying to be. 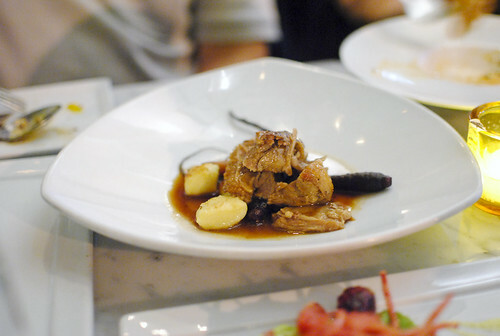 The pork clearly displayed a welcome savory depth both from the meat and the jus. The couple of bites I had were sort of gristly and fatty, but I think that was more of a function of what the rest of my table left me (I had the last bites of this one). The potato gnocchi quite good. 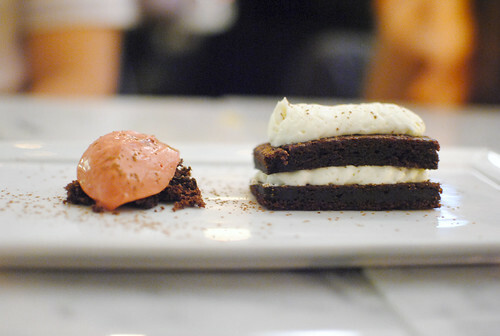 I liked the presentation of this dessert with the layers of chocolate cake and sweet cream cheese mousse. Both of those layers were good on its own, but I thought the beet ice cream added some much-needed pizzazz to the dish, bringing both color and a strong beet flavor that went pretty well with the chocolate. I thought this was easily the best dish of the evening. The bread pudding was served warm (almost hot) with a balanced banana flavor, topped by a rich bourbon sauce and light Chantilly cream. I thought the flavors were spot on between the banana, bourbon and vanilla, while caramelized pecans added some texture and nuttiness. Not too sweet. So good. I thought Moody’s food was pretty good. 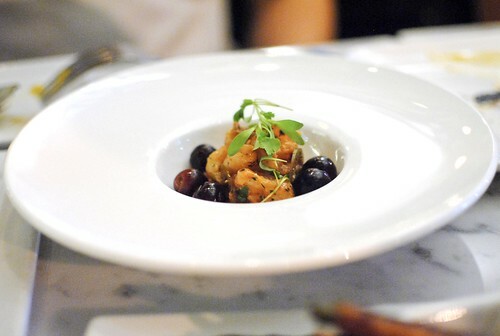 The menu was approachable yet interesting, and execution was largely on point. Plus, the price was right; food was under $50pp. 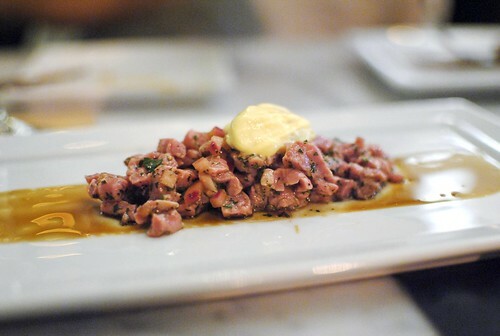 Highlights for me included the sweetbreads, beef tartare, rock cod and of course the bread pudding. I’ll be interested to see what Moody does next. I know I’m not the only one…one of my coworkers returned for both of the remaining nights after this meal. The Foie was ridiculously good, so no wonder I came back. 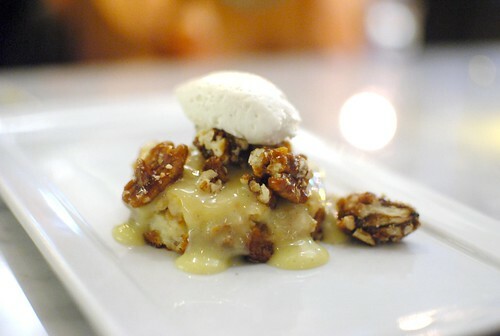 I also agree on the bread pudding, just amazing. Overall a great meal. Maybe in time this may come to replace LudoBites. Haha interesting point given it sounds like Ludo’s going to retire his LudoBites concept!